Parenting Plans for Families After Divorce presents a fresh, contemporary, and practical guide that shows divorcing parents how to create a healthy and vibrant Post-Divorce Family. It acknowledges that while the parties' original family will take on a different form after the divorce, their original family will still exist and need to be nourished. It discards the "one size fits all" approach to divorce and provides creative processes and solutions that strive to meet the needs of each family member. Using a step-by-step method, the author explains how to write a Parenting Plan in which the parents make the decisions, not the judge. 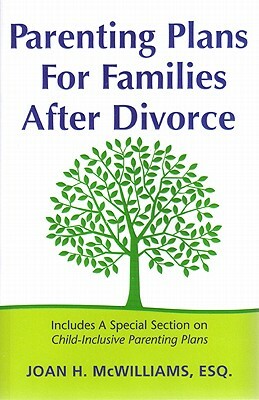 It contains suggestions for monitoring children's use of social media, addressing the needs of nontraditional families, adopting child-inclusive provisions, and designing dispute resolution techniques Using a Celtic Tree, a symbol of love, strength, connection, and renewal, Ms. McWilliams delivers a pragmatic and commonsense approach for dealing with the variety of issues that families encounter in divorce. A pioneer in the field of mediation, Joan McWilliams has acted as a third-party neutral for more than twenty years. Before starting her mediation practice, she served as a law clerk for the 10th Circuit Court of Appeals and was a partner in a large Denver law firm. She is the recipient of the Alumni Professional Award from the University of Denver Sturm College of Law and the Family Law Icon Award from the Colorado Bar Association. She is listed in The Best Lawyers in America, Super Lawyers 5280, and U.S. News's Best Lawyers/Best Law Firms. She is the author of the award-winning book, The PeaceFinder: Riley McFee's Quest for World Peace, and Creating Parenting Plans That Work. She frequently speaks on the Post-Divorce Family Model and the ways in which families can draft plans to creatively resolve parenting and financial issues in their divorce.